This article is about the American football player. For the fictional character, see Hopalong Cassidy. Howard Albert "Hopalong" Cassady (born March 2, 1934) is a former professional American football running back. He won the Heisman Trophy in 1955 and was inducted into the College Football Hall of Fame in 1979. He played professionally in the National Football League (NFL) for eight seasons, seven of them for the Detroit Lions, with whom he won the 1957 NFL Championship Game. Cassady was born in Columbus, Ohio and attended the now closed Central High School. 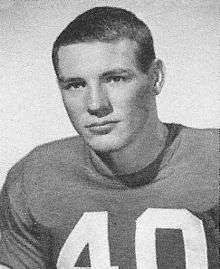 Cassady played football for the Ohio State Buckeyes from 1952 to 1955. During his college career, he scored 37 touchdowns in 36 games. He also played defensive back; a pass was never completed on him in his four years at the university. He was twice selected as a consensus All-American, in 1954 and 1955. The 1954 Buckeyes finished the season 10–0 and won a consensus national championship. That year Cassady finished third in the vote for the Heisman Trophy behind Alan Ameche of Wisconsin. In 1955, Cassady won the Heisman Trophy (by the largest margin at the time), the Maxwell Award, and was named the Associated Press Athlete of the Year. During his playing days, Cassady was 5'10" and 170 pounds. Cassady earned the nickname "Hopalong" during his first game as a freshman for Ohio State. Columbus sportswriters who saw him play said he "hopped all over the field like the performing cowboy", a reference to the fictional character Hopalong Cassidy. In that game Cassady came off the bench to score three touchdowns in a win over Indiana University. During an Ohio State practice in 1953 Cassady was having some issues executing an off tackle run. At this point Coach Hayes told Cassady to take a seat and brought in the back up running back Robert Croce. Robert Croce executed the play flawlessly and carried the ball for 20+ yards. Coach Hayes then said to Cassady, "Cassady, did you see that Croce was just slow enough to hit the hole. You're hitting the line too fast!" Cassady held some Ohio State career records for many years following his graduation. He held the career rushing record (2,466 yards) until he was surpassed by Jim Otis in 1969, the career all-purpose yards record (4,403 yards) until he was surpassed by Archie Griffin in 1974, and the scoring record (222 points) until he was surpassed by Pete Johnson in 1975. Cassady also played baseball for Ohio State. He led the team in home runs in 1955 and in stolen bases in 1956. While at Ohio State, he also became a member of the Sigma Chi fraternity. Cassady is a member of The Pigskin Club Of Washington, D.C. National Intercollegiate All-American Football Players Honor Roll. Cassady played nine seasons in the National Football League: seven for the Detroit Lions, and one each for the Cleveland Browns and the Philadelphia Eagles. In the NFL, Cassady was an all-purpose back, playing both the receiver and the running back positions. In doing so, he scored twenty-seven touchdowns in his career. After retiring from football, Cassady became an entrepreneur; he formed a company manufacturing concrete pipe. More recently, he has served as a scout for the New York Yankees baseball team, and as the first base coach for their former AAA affiliate, the Columbus Clippers. His son, Craig Cassady, played defensive back at Ohio State, and played briefly for the New Orleans Saints in the 1970s.